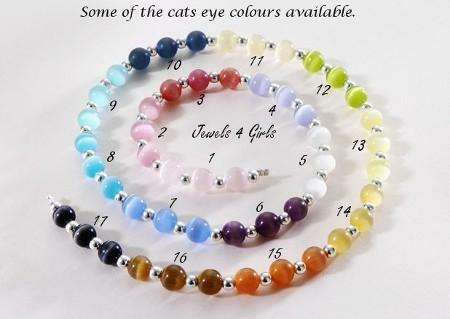 Cats eye beads are truly beautiful. 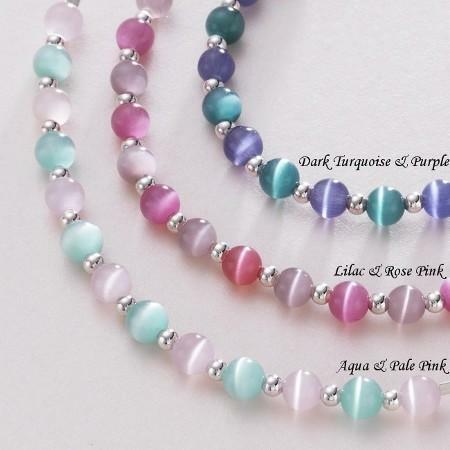 No wonder they are so popular for children's jewellery and in particular in personalised name bracelets and necklaces. Each bead has a pupil like slit which appears to move as the stone is moved. They are vibrant and eye catching and they come in a huge range of colours, some of which are shown below. 1.very pale pink, 2.mid pink, 3.dark/rose pink, 4.lilac, 5.white, 6.plum, 7.ocean blue, 8.turquoise, 9.pale blue, 10. navy, 11.ivory, 12.olive, 13.lemon, 14.caramel, 15.sienna, 16.brown, 17.black. 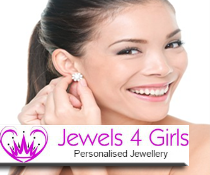 Buying jewellery for a special girl? If you see any item of personalised jewellery or custom made jewellery on this website that you would like made with a different combination of colours to the ones shown please just contact us to discuss your requirements. You can always expect a fast and helpful response.